OSEP Update: Collaboration and Capacity Building Across Programs! EARLY CHILDHOOD CHECK-IN: Data and Privacy! FROM THE FIELD: Parent Centers hard at work! 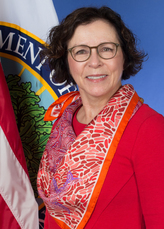 After considering and incorporating extensive feedback from stakeholders across the education system and the public, the U.S. Department of Education announced final regulations to implement the accountability, data reporting, and state plan provisions of the Every Student Succeeds Act (ESSA), with a focus on supporting states in using their flexibility to provide a high-quality, well-rounded education, and ensure equity remains at the core of implementation. Today closes out November, a month jam-packed with collaborative work across the country, and many opportunities to work directly with you! OSEP kicked off the month in Denver at the IDEA Fiscal Forum. Coordinated by the Center for IDEA Fiscal Reporting, the Forum allowed states to share best practices and common issues with each other, and to problem solve with OSEP and TA Centers. Thanks to our hosts, and to the National Center for Systemic Improvement (NCSI) and IDEA Data Center for their participation, and most of all to states for their willingness to engage in open and productive conversations! OSEP also had a chance to participate in the NCSI-hosted State Learning Collaborative Team Meetings, held this month in Dallas, TX. On November 15 and 16, Part C state teams worked on Family Outcomes, Social/Emotional Outcomes, and Knowledge and Skills- and Results-Based Accountability. On November 30 and December 1, Part B state teams and NCSI members will work on Math, Graduation-Post-School Outcomes, Language & Literacy, Systems Alignment and Results-Based Accountability. OSEP had the opportunity this month to work with our federal partners in the Early Childhood realm at the Home Visiting Summit on November 16, and at the Race to the Top - Early Learning Challenge and Preschool Development Grant Grantee Meeting, which was held November 16-18. Visit the Office of Early Learning's site for information on either of these programs. Finally, we are looking forward to the upcoming Combined Federal Programs Meeting, for State Directors of Title I, Title II, Title III, School Improvement Grant, Equitable Access to Excellent Educators, and Special Education, on December 12 and 13. This meeting will be a great opportunity for open dialogue and to align ESSA implementation across programs within states. Last month OSEP released a guidance document titled Understanding the Confidentiality Requirements Applicable to IDEA Early Childhood Programs Frequently Asked Questions (FAQ). Join the DaSy Center and privacy and legal experts from the Department for the Privacy, please! webinar, to learn more about this FAQ document on Thursday, December 15 at 3 pm ET. Recently released by the U.S. 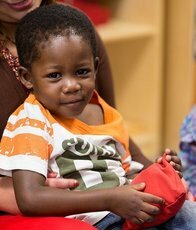 Departments of Health and Human Services and Education, the Integration of Early Childhood Data report helps states refine their capacity to use existing administrative data from early childhood programs to improve services for young children and families. The report covers key considerations when states integrate data and highlights progress in eight states that are actively developing and using early childhood integrated data systems (ECIDS). The report discusses technical assistance and other resources available to states as they develop their ECIDS. October 22, 2016: Letter to Jennifer Carroll addresses the question of whether once a district’s evaluation is complete, and the parent communicates a desire for their child to be assessed in a particular area in which they have not previously expressed concern, does the district have the opportunity to conduct an evaluation in the given area before a parent invokes the right to an independent educational evaluation (IEE). OSEP noted that IDEA affords a parent the right to an IEE at public expense, and does not condition that right on a public agency’s ability to cure the defects of the evaluation it conducted prior to granting the parent’s request for an IEE. Therefore, it would be inconsistent with the provisions of 34 CFR §300.502 to allow the public agency to conduct an assessment in an area that was not part of the initial evaluation or reevaluation before either (1) granting the parents’ request for an IEE at public expense or (2) filing a due process complaint to show that its evaluation was appropriate. may be found on the Department's website. New Technical Assistance Resources from CIFR! CEIS Resources Step by Step Guide: Designed to help state and local education agencies navigate the steps associated with planning for, providing, and tracking required or voluntary coordinated early intervention services (CEIS). The interactive guide provides and links to resources and tools for each step in the CEIS process. LEA MOE Calculator: The Local Education Agency (LEA) Maintenance of Effort (MOE) Calculator assists state and local education agencies in reporting MOE data. Personnel may use the tool to document local, or local and state, fiscal effort for the education of children with disabilities in an LEA over a five-year period, plus up to five years of historical data. It also assists users in determining whether an LEA's effort meets IDEA's LEA MOE eligibility and compliance standards. 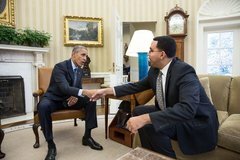 This month U.S. Education Secretary John King Jr. issued a letter urging state leaders to end the use of corporal punishment in schools, a practice repeatedly linked to harmful short-term and long-term outcomes for students. The Department has also released new maps that show where the use of corporal punishment occurs across the country, available alongside other relevant resources on the Rethink Discipline website. 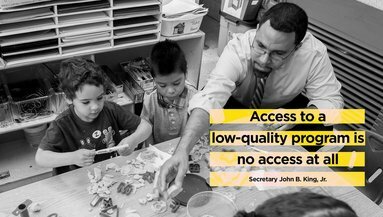 The Department also released new ESSA guidance, the ESSA Fiscal Changes & Equitable Services Guidance, on November 21, 2016. 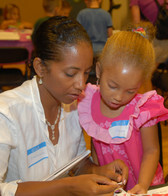 This month we're highlighting the work of a critical resource for families, our Parent Centers! On November 1, project officers for the Parent Training and Information Center (PTI) Program met with the nine parent technical assistance centers (PTACs) to discuss technical assistance plans for the coming year. The PTACs were provided with information about upcoming regulations and guidance that will affect students with disabilities and ongoing work on family engagement. On November 2 and 3, the Strengthening Parent Center Leadership meeting brought project directors and board members from the newly funded community parent resource centers (CPRCs), along with new project directors from established centers, received a wealth of information from the PTACs and their project officers to strengthen their ability to meet their grants’ programmatic and administrative requirements. Presenters emphasized the need to work closely with project officers to improve their projects. For more information on what services PTIs and CPRCs provide to parents and families, check out this guide, available through the OSEP-funded Center for Parent Information and Resources.